Christmas has come and gone. The boys had a wonderful holiday break and got back in school just long enough for there to be a coastal snow storm which has kept them home from school since Thursday of last week. My office doesn’t close, so I had to brave the icy roads, but few other people did. Since the temperatures have not been above freezing for the last 9 days, that’s a good thing. We aren’t equipped to clear snow from the roads around here. I called a potential violin/viola teacher last week and got on his wait list. At least he answered the phone. I’ve tried to contact a few other teachers who haven’t even bothered to acknowledge me, even to say they had no vacancies. It’s apparently a bad time to go teacher-hunting. It appears that most teachers operate on a typical school schedule. I read an article the other day that claimed that 25% of new violin students are over the age of 18. Maybe teachers will eventually begin to count on adults as part of their target market and shift their thinking a bit. Without rehearsals for the last few weeks, and no lesson to prepare for, I have not picked up either my violin or viola in some time. Quartet rehearsal is tomorrow and I’m not really prepared. It’s really going to be rough as I switch off between violin and viola and switching clefs can be problematic on a good day. Then we have chamber rehearsal on Thursday, fiddle camp is Friday-Monday, and orchestra starts up again that Tuesday. It’s a full plate. Hopefully my little break won’t be too detrimental. I recently stopped taking lessons with my violin teacher of 5.5 years. We haven’t parted ways. In fact, he still teaches my oldest son, and I will still be taking part in some of his holiday concerts for charity. There were several reasons behind my dropping lessons. The biggest reason is just pocketbook pressure. With three of us in the family taking music lessons, and cost of living going up, something has to give. Of course, I’m going to give the precedence in taking lessons to my children. I want to be taking lessons, but other things have to come first-like paying for car insurance for my teenager who can’t wait to get his driving permit in two weeks. One of the secondary reasons for leaving was that this fall I ended up being overscheduled between new travel demands for my job and people’s discovery that I owned a viola. Suddenly I found myself a member of four musical groups; and the firehose of new material really put a damper on time to spend on violin lessons. Learning my way around alto clef took some effort. Orchestral parts for viola are very different than those for 1st violin. Fewer notes, but much more awkwardly placed on the strings. Along with suspending lessons, I am also planning on dropping one of the groups to free up some time. It is interesting how having to rapidly learn so much new material really helped me grow my sight reading skills. That was a nice side effect. However, dropping the one group where I only play violin leaves me primarily playing viola these days. While my teacher has been wonderful up to this point, he does not have a deep understanding of viola. I thought it might be beneficial to eventually look for a teacher who plays both. And lastly, as much as I admire and appreciate my teacher, he and I have increasingly divergent opinions on technique and interpretation. I concede that I don’t know what I don’t know, but it is possible that my research might have more validity than my teacher gives credit to. It’s worth me looking around to see if there is someone with whom I could explore those concepts. I had a consultation with another teacher over the weekend who gave me some useful tips to help with some technical issues. It is humbling to have someone provide constructive criticism in a way you aren’t used to receiving it, but a good exercise. I am hoping to have several such consultations so that I may decide what approach to eventually steer towards. I joined an orchestra in August. It would be a challenge for me if I were playing violin, but I got in on viola. 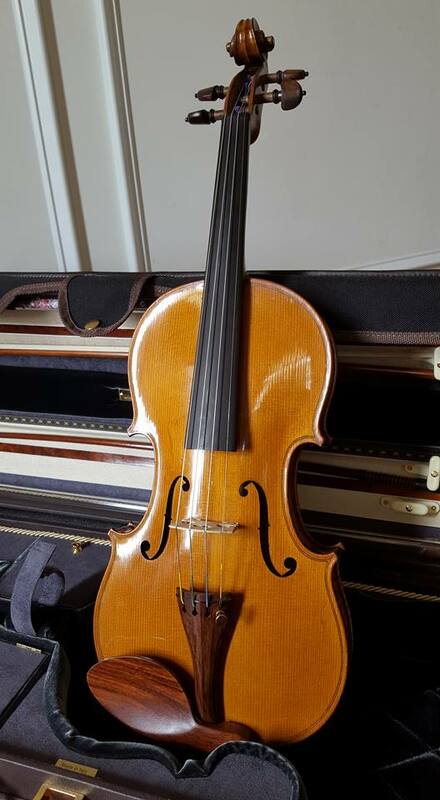 I have been playing violin for 5.5 years, but viola isn’t just a bigger version of the violin. It is tuned lower and uses a different clef – a clef I didn’t read at the time I took the audition. Plus, playing viola requires a change in technique. Being in an orchestra for the first time is a bit of a shock to the system because it is a very different experience from the slow and easy pace of the string ensemble I have been participating in for the last three years. The orchestra is playing music that I have never played, and doing so at lickety-split speeds. Adding to that, I’m learning a new clef and instrument as I go. Total immersion is supposed to be the best way to learn, right? In addition to joining an orchestra, I was asked to join a quartet on viola as well. Fortunately for me, I really like the other ladies in the group and though we are on varying skill levels, we really seem to work well together. The wine helps. If only we had wine at orchestra! My son recently pointed out that the reason why I am having a difficult time organizing, or even getting to my practice, is that I am in four groups. I had no idea. But it’s true, I’m in string ensemble, orchestra, quartet, and a Scottish fiddle group. All four groups got new music in August, and again several times since. Talk about overwhelming! If I were smart, I would probably drop at least one group but I love all of them I have backed off on the Scottish fiddling somewhat because it has the lowest demand. However, I still plan on going to fiddle camp in January so I need to put some effort in to improve my Scottish fiddle chops. Looks like dropping that one isn’t in the cards. Oh well, being smart is overrated anyway. I can’t drop string ensemble because my son is in it as well and it’s pretty much his only extra-curricular activity. It’s also the reason he is in honors orchestra. Who am I to stand in the way of a good grade for a good kid who is trying to do the right thing? If I have to be there anyway, I might as well play. After three years, it’s kind of my musical home and it would be weird not to. I won’t drop orchestra or quartet because those two things were my goal from day one. Looks like I need to find a way to get organized. Here’s to crazy dreams, ya’ll! First off, day three of string camp was great. I don’t know exactly what happened, but a switch must have flipped overnight because it was fine. Nothing changed about my playing other than the fact that I had more familiarity with the music. Maybe that was it. Having slept on it, my mind probably assimilated everything and I could finally move forward. That has been my modus operandi since I started playing. 1. Get assigned a piece and go over the hard parts slowly.2. Go home and analyze the piece – break into smaller, more manageable chunks, and try to perfect by the next lesson. 3. Have lesson – figure out with the teacher what needs more work. 1. Drilling scales, arpeggios, and etudes. 2. Practicing with a metronome. 5. Focusing on dynamics and time signatures. Basically, I have been getting by because I work hard at just what I need to do to get through a lesson. That doesn’t work if I want to reach my goal of being able to play with others. I know what I need to do now. The trick will be to rise to my own expectations. The thing is, I really do not want to quit and I’m mucho embarrassed by how emotional I was those first two days. So what if I couldn’t play, right? There were things I could do to make the situation easier. I could have practiced the violin II part more before the camp. I could have planned my time more wisely. Knowing I get anxious, I could have gotten a script for Xanax (possibly-not sure on that one). Perhaps I could have asked to move to the back of the section where I wouldn’t have felt so exposed. I know I said I don’t have time to play fun stuff and that’s true. But why is that true? How can I plan my time better to make sure I feel like a success and not a failure? So time management also needs to play a part in the equation. We did perform at the end of camp. The general track group played the orchestral number. I still don’t like the piece, but I understand the educational significance for it. Was it perfect? Not even slightly. Was I the only one who messed up? Not remotely. On day three I was able to expand my tunnel vision to something that was more attuned to the group as a whole rather than my flaws as the sole object of my attention. The camp also focused on small chamber groups that also performed at the end of the camp. There were several very talented people in mine, and everyone else was a more confident player than I am. In our small group, we had an interesting situation in that there was one very self-assured player who frequently pushed the tempo and volume because he wanted to be a star. And we had another self-assured and extremely competent player who was more interested in the group’s ability to play well as a whole. The result was the one show-off player looked exactly like what he was, and the rest of us put on, not a flawless, but a credible performance despite him, thanks to the rock-steady support of the other fellow. I learned that I really want the group to perform well as a whole rather than be a super star. I don’t mind being second fiddle. Now I just have to do the work that will let me be a good one. Come May, I will have been playing the violin for 4 years. One of the biggest obstacles of beginning this instrument as an adult is finding other people to play with. Unlike piano, string instruments are really more fun when played in a group. Sure, there is plenty of solo music. And many people are content to play in their living rooms for the simple joy of it. But the fact of the matter is, for me – playing in a group is what I long to do. For several years, maybe even since I started playing, I have wanted to play music with others. I found a local adult string ensemble. It’s fun, and I enjoy it, but I have to work hard to hold up my end of the score. I had heard of an adult chamber music camp and thought it would really help me with learning some of the skills I need to level up. I’m at that camp now. There are several tracks one can take at the camp. There’s a beginner track for people who have been playing less than three years and/or don’t read music well. There’s a performance track for experienced players with 12 or more years of experience, and there’s a general track for everyone else. Well, I don’t belong in the beginner group so I picked the general track. However, this venue is too small to have a performance track, so everyone who is not “basic” is in the same group. We were given some music ahead of camp to learn with the instruction – learn what works best for you and you’ll probably be playing that part at camp. No problem. In my world, the better players play second violin because the inside voice is more difficult to play well. So I learned the first violin part because – hello melody, duh. When I got to camp it turned out they assigned me to the second violins. Great, I don’t know that part. Oh well, I’ll be fine. I’ll just read it, right? Except the group doesn’t play it through slowly first in the way that I’m accustomed to. Nope, they have all been playing since they were children, and they go lickety-split through the piece. And it has been that way the entire time I have been here. I think he’s right. This hasn’t been fun for more than a year. I work hard. I’m not getting anywhere, and I don’t have time to deviate from the program to play “fun stuff”. Every mistake is the MOST IMPORTANT THING. I just cant let them go, which leaves me no time to enjoy just playing. The better you play, the more enjoyable it is to play both solo, and in a group. There is no timeline in the world that can tell you when you will be “good enough” to be happy with your playing. Each person develops at their own rate and in their own time. However, some people might be given plenty of tools to make that happen, and they will still atrophy at some point. I suppose one can find ways to move on once that occurs. But at what point do you throw in the towel and decide it’s not worth it any longer? After all, it’s a huge investment in time, money, and equipment. I have been asking myself that question for over a year now. Maybe this was the world’s way of telling me to stop playing. I think about quitting every day. It’s probably just time to stop the madness and throw in the towel. Saturday was my third performance with the string ensemble I play with. Nobody died. In fact, except for four consecutive measures in one piece where everyone kind of faltered, it was pretty good. Of course we had ringers in both the cello and violin sections, so that helped. I don’t feel terrible about the performance, and I don’t feel great about it. We could have done better, but we have certainly done far worse. The two things that stuck out for me was when my stand partner, two rehearsals out from the performance, suggested I not try to play all the notes in a fast 32nd note section (because I was really bombing on it); and when the lady to my right suggested I sit in the end seat because she thought I was good. I think it was because she felt too exposed on the end though, so I’m not sure how I feel about it. So I sort of received one compliment and one piece of advice aimed at making sure I don’t screw up the section. All I know, is I have a long way to go. I need to spend some serious time with the metronome. My family came to see me, along with a coworker and her husband, and my sister, who brought me flowers. It was nice of them to take the time out to come. Plus, flowers – yay! For those who don’t know, I bought a new violin. 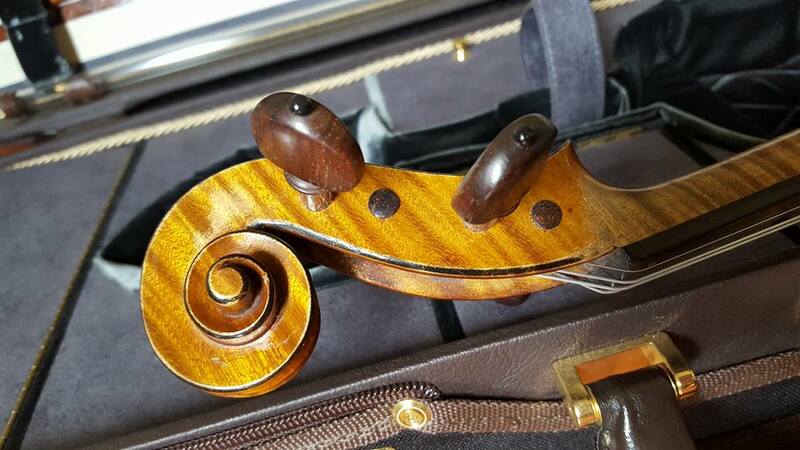 It’s a French workshop violin from 1908 and is nearly full size at 352mm. At first it made me a bit tired to play because it is SO much bigger than my 3/4 (331mm), but I seem to have gotten used to it now. Playing the old violin now seems cramped, but I like it better for fiddle music. I haven’t decided whether to sell it yet. Adam at Four Strings is restoring an old German violin that is between my old one and new one in size that he is sure will outplay the 3/4. 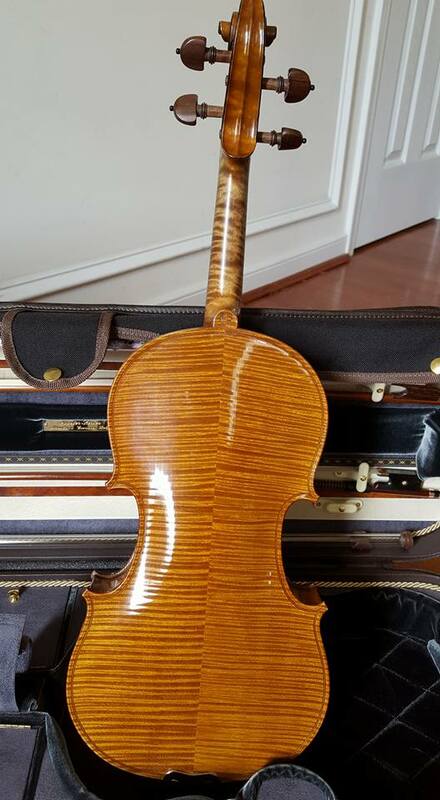 If I like it, I might sell the 3/4 and buy the other one, though I would be sad to let go of my first violin. Here’s a picture of the new addition. I’m calling it Colette for now, but that may change. It’s a Francois Barzoni, which is the brand made in Mirecourt for Beare and Sons in London. Like all “brand” name instruments, they range from beginner styles all the way up to exceptional. This one is one I would describe as “upper intermediate”. The nice folks at Brobst Violins were really helpful and let my teacher and I play as many violins as we wanted. I don’t know if they showed me anything out of my price range because I didn’t ask about prices until about four hours into the trial process, when we had narrowed things down to two fiddles and three bows. I wish now that I had looked at labels as we were going through the violins (we tried about 25), but at the time I didn’t want to be influenced. Along with Colette, I also purchased a Richard Grunke gold-mounted bow that is truly wonderful, and may be the only 7/8th size bow I’ve ever come across. All in all, with the new violin, bow, and a new case, I squeaked out of the shop only $300 over my budget. I call that a serious win.